Flow cytometric analysis of the peripheral monocytes using the anti-BTK antibody was used to characterize a 27 year old male patient with mild hypogammaglobulinemia (IgG, 635 mg/dl; IgM, 11 mg/dl; IgA, <5 mg/dl). He had suffered from frequent pneumonia since age 25 but had no history of frequent infections in his childhood or in adolescence. Sequencing of the BTK cDNA obtained from an Epstein–Barr virus-transformed B lymphoblastoid cell line derived from the bone marrow of the patient was performed to confirm a genetic defect. Flow cytometric analysis of cytoplasmic BTK protein in peripheral monocytes indicated that the patient presents a rare case of adult-onset XLA and that his mother is an XLA carrier. Sequencing of the BTK gene revealed a deletion of AG in the codon for Glu605 (AGT), resulting in an aberrant stop codon that truncates the BTK protein in its kinase domain. This case suggests that some XLA cases may remain undiagnosed because they only show mild hypogammaglobulinemia and they lack repeated infections in childhood. Flow cytometric analysis is a powerful method to screen these patients. XLA is a prototype of humoral immunodeficiency first described by Bruton in 1952 . XLA is characterized by a paucity of circulating B cells and a significant reduction in the serum immunoglobulin concentrations that predispose the affected patients to frequent and severe bacterial infections . The BTK gene, which encodes a cytoplasmic tyrosine kinase, was identified as the gene responsible for XLA [3,4]. Whereas most XLA patients develop clinical symptoms in childhood, there might be late-onset XLA cases among patients with a lower level of serum immunoglobulins who have often been clinically misdiagnosed as common immunodeficiency, selective IgG or IgA deficiency. Direct detection of BTK mutations by gene analysis is necessary for diagnosis of XLA, but it is time consuming, expensive, and labor intensive to screen these patients. This article presents a rare case of an adult-onset XLA patient, the diagnosis of which was indicated by the flow cytometric analysis of peripheral monocytes using anti-BTK antibody  and was confirmed by the sequencing analysis of the patient's BTK gene. Flow cytometric analysis of cytoplasmic BTK protein in peripheral monocytes has been described previously [5,6]. Briefly, mononuclear cells were surface stained with phycoerythrin-labeled anti-CD14 antibody, then fixed, permealized, incubated with anti-BTK monoclonal antibody 48-2H  or control IgG1 (Dako, Kyoto, Japan), and then incubated with fluorescein isothiocyanate-labeled secondary antibody. The cells were first gated by CD14 to select monocytes, and then histograms were plotted on fluorescein isothiocyanate intensity. The BTK cDNA of the patient was sequenced as previously described . Briefly, an Epstein–Barr virus-transformed B lymphoblastoid cell line derived from peripheral blood of the patient was established and subject to reverse transcription polymerase chain reaction (PCR) to amplify the protein coding region of the BTK cDNA, which was then sequenced. Based on the sequence information, the normal primer A (5'-ATGAGAGATTTACTAACAGT-3'), the deletion-specific primer B (5'-ATGAGAGATTTACTAACTGA-3'), and the common downstream primer C (5'-AGAGCAAGACT-GTGTCACCA-3') were synthesized. Genomic DNA from the patient, his mother and his brother were extracted from peripheral blood and amplified by PCR using either primer A or primer B, together with the common downstream primer C.
A 26 year old Japanese crane operator was admitted to our affiliated hospital with fever, cough and chest pain. This was followed by admissions to other hospitals with bacterial pneumonia twice within 18 months. Because the patient never experienced recurrent infections until age 25, his B cell numbers or IgG level were not checked in the routine examination, and he had never been suspected of common variable immunodeficiency or XLA. His chest X-ray on admission to the hospital in June 1997 showed infiltration in the lower left lobe of the lung with encapsulated pleural effusion (Fig. 1A). No bronchiectasis was detected. Because of hypogammaglobulinemia on laboratory examination (IgG, 635 mg/dl; IgM, 11 mg/dl; IgA, <5 mg/dl) and the history of repeated pneumonia, the patient was referred to our hospital for further examination. (A) Serial chest radiographs of the patient. The chest X-ray films taken at other hospitals in 1996 reveal infiltration in both the upper and lower lobes in April, and in the lower lobe of the right lung in November. The chest radiograph on admission to our hospital in June 1997 demonstrates infiltration in the left lower lobe and the existence of pleural effusion. (B) Flow cytometric analysis of BTK expression in peripheral monocytes. The solid and the dashed lines indicate cells stained with anti-BTK or control antibody, respectively. FITC, Fluorescein isothiocyanate. (C) The genomic organization of the human BTK gene and the domain structure of BTK cDNA. Exons 1–19 of the BTK gene, and the BTK cDNA with its functional domains are shown . Amino acid numbers (1–659) are shown under the cDNA. The arrowhead indicates the position of the mutation identified in this case. 5UT, 5'-untranslated region; PH, pleckstrin homology domain; TH, Tec homology domain; SH, Src homology domain; 3UT, 3'-untranslated region. (D) Detection of a 2 base pair deletion in the BTK cDNA. The BTK cDNA of the patient was sequenced as described in Materials and methods. The chromatograph of the autosequencer shows a 2 base pair deletion. (E) Family pedigree and the PCR-based detection of the mutated allele. Two generations are depicted. The index case is marked by an arrow. Genomic DNAs from the patient, his mother and his brother were extracted from peripheral blood and amplified by PCR using either primer A or primer B, together with the common downstream primer C. Normal genomic DNA gave a band when primer A was used (lane N). The patient's DNA gave a band when primer B was used (lane D). 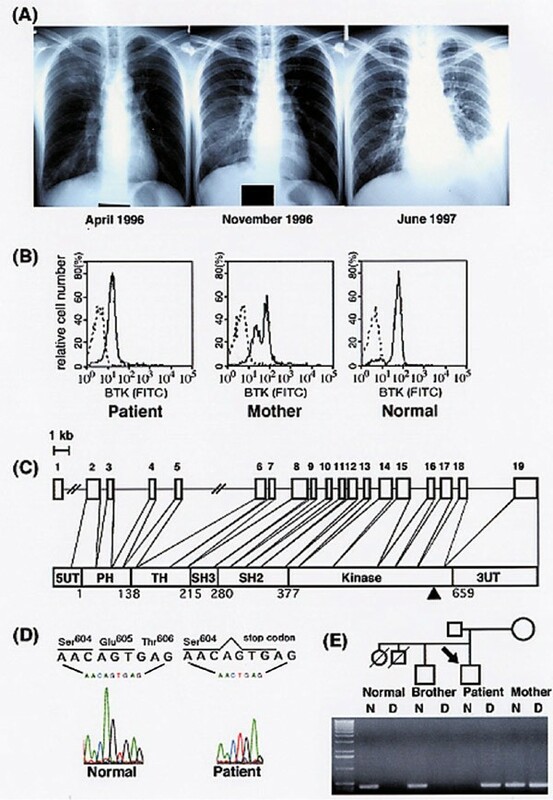 The patient's mother, a carrier of the mutated gene, gave bands when both primers A and B were used (lanes N and D). The patient had four siblings (Fig. 1E). His sister died shortly after birth, and his eldest brother, who had a history of repeated pneumonia, died of drug-induced liver failure at age 7. The routine hematologic and biochemical examination of the patient revealed no abnormal findings. He was negative for both HIV and HTLV-1. Blood type testing showed that, although his blood type was O, he had neither anti-A nor anti-B antibodies. Although we did not directly examine the function of his immunoglobulins, anti-virus antibodies commonly positive in normal Japanese adults (such as anti-measles, anti-rubella, anti-cytomegalovirus, and anti-Epstein–Barr virus) were all negative, indicating that his IgGs were not functional. In contrast, his cellular immunity was intact because a lymphocyte stimulating test by phytohemagglutinin and concanavalin A showed normal responses. These findings, together with his moderate hypoglobulinemia, prompted us to investigate his B lymphocyte system. The surface marker examination of the patient's peripheral lymphocytes showed marked deficits in the B cell populations (CD19+, 1%; CD20+, 6%). Measurement of the BTK protein in CD20+ B cells using anti-BTK monoclonal antibody 48-2H  gave an uninformative result because only a small number of CD20+ B cells were present (data not shown). We then measured BTK protein in peripheral monocytes because they have been reported to express BTK (Fig. 1B). The patient showed a partial BTK deficiency, and his mother showed a two-peak BTK expression profile. In females, non-B hematopoietic cells undergo random inactivation of the X chromosomes . Demonstration of a two-peak BTK expression pattern in peripheral monocytes is therefore diagnostic of the XLA carrier state in females . We concluded that the patient has XLA and that his mother is an XLA carrier. Hypogammaglobulinemia observed in the patient was considered a clinical manifestation of his Bruton's disease. To further confirm the diagnosis, the patient's BTK gene was sequenced  and was found to have a 2 base pair (AG) deletion in the codon for Glu605 (AGT) in exon 18 that encodes a part of the kinase domain of the BTK protein. This deletion places a stop codon just downstream, thus producing a truncated BTK protein with 604 amino acid residues instead of the normal BTK protein with 659 residues (Fig. 1C,D). This mutation has not been reported to date . Genomic DNA from other family members was then examined by PCR designed to detect the normal or the mutated allele separately (Fig. 1E). The patient's mother was confirmed to be heterozygous for the mutated BTK gene. His second-eldest brother, who has no history of repeated infections, was normal for the BTK gene. Most XLA patients develop clinical symptoms during the first year of life and, without antibiotics and immunoglobulin replacement, they die in infancy. The case presented here is the only adult-onset case of the 107 cases in the XLA registry of the Ministry of Health and Welfare, Japan. This case clearly illustrates the utility of flow cytometric analysis for the diagnosis of XLA, and also raises questions regarding the factors that determine the onset of the XLA phenotype. We found that, for the flow cytometric analysis, it is key to measure BTK expression in peripheral monocytes. Both XLA patients and XLA carriers are detected as shown here, and as reported elsewhere . In female XLA carriers, B cells manifest the skewed inactivation of the mutated X chromosome, reflecting the role of the XLA gene in early development. Non-B hematopoietic cells in XLA carriers, on the contrary, undergo random inactivation of the normal and mutated X chromosomes, and thus the product of the BTK gene can be detected in B cells and other hematopoietic cells. This is the reason why demonstration of BTK mosaicism in non-B hematopoietic cells leads to the detection of obligate XLA carriers. The BTK function in monocytes remains unclear. Monocytes with deleted BTK are not representative of all that is happening in the B cells, despite the fact that the detection of the BTK production in monocytes by flow cytometry is a powerful diagnostic tool for screening XLA patients. The cause for the delay in the appearance of the presented patient's clinical symptoms until age 25 is of much interest. Mild XLA is clinically likely to occur at any age incidentally [10,11], and these patients might be misdiagnosed as suffering common variable immunodeficiency . The truncated BTK protein in this patient is possibly able to function to some extent, although less effectively than the wild type. This could explain why this patient's hypogammaglobulinemia was not severe. Another explanation for this latency is the contribution of as yet unidentified factors. Reports have shown that, even in an XLA family with the identical BTK gene mutation, some affected males have substantial levels of immunoglobulins whereas others are nearly agammaglobulinemic . The present patient's eldest brother had a history of frequent infections, suggesting that the brother was also an XLA patient. If this is the case, then as yet unidentified factors provide the more likely explanation for the difference in the age of onset for the patient and his eldest brother. Although BTK has been identified as a gene responsible for XLA, the mechanism that links the defect in BTK function to the development of XLA is not known. This case provides valuable information, suggesting a direction for the pursuit of this link, and demonstrates the power of flow cytometric analysis in diagnosing XLA. This study presents a rare late-onset XLA case, suggesting that some XLA cases may remain undiagnosed because they only show mild hypogammaglobulinemia and they lack repeated infections in childhood. Flow cytometric analysis using the anti-BTK antibody is a powerful method to screen these patients for BTK deficiency.